We’ve talked a few times this year about the adjustments Collin McHugh’s made this year. He now pitches off of his slider/cutter, a pitch he throws about 40% of the time. He’ll throw four-seam fastballs only about 1/3 of the time. His curve’s still his swing-and-miss pitch, and he’ll use that about 1/4 of his pitches, and he’s got a change-up that he uses against lefties. The way he uses that slider – to righties and lefties alike, and all the damn time – it’s functioning as a cutter. Like many pitchers, he’s essentially using it as a cut fastball to neutralize lefties or to get grounders. 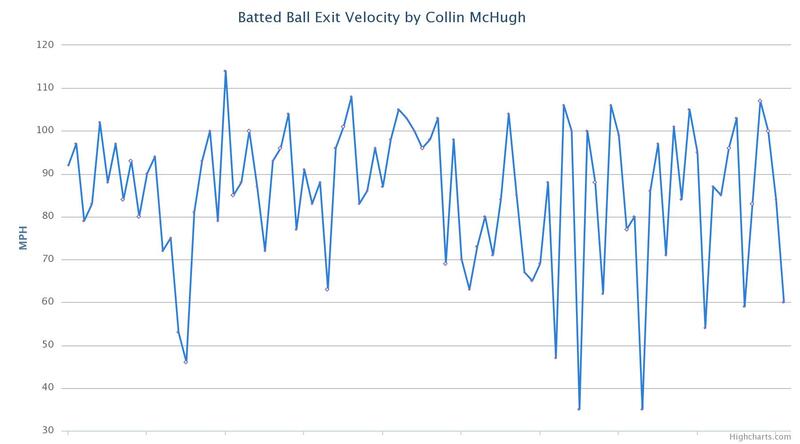 McHugh’s problem is that the pitch hasn’t been working all that well. *Righties* are hitting .356 off it, and have as many extra-base hits as they do strike-outs. The only HRs he’s given up to lefties on the year have come on the pitch as well. Worse, righties have started to hit his fastball as well, and that’s led to a dramatic shift in his platoon splits. Last year, he dominated lefties and righties alike, with righties faring a bit worse – as you’d expect. His splits against lefties haven’t really changed, but this year, righties have a slash line of .297/.349/.506, and thus it shouldn’t be much of a shock that he’s now facing many more righties than lefties (the opposite was true last year). There are an awful lot of 100mph+ exit speeds here. I’d love to compare it to 2014, but I can’t. Instead, I can just say that McHugh’s percentage of batted balls over 100mph looks a lot more like Kyle Kendrick’s than Garrett Richards. Mike Montgomery’s made two starts, both at home, and fared remarkably well. He’s not striking anyone out, and he’s been lucky in pretty much every way, from a low BABIP and HR/FB to a sky-high strand rate. But he’s also been lucky in the hitters he’s faced. In his 13 IP, he’s seen 45 right-handed batters and just 5 lefties. That seems like it’d be a trial by fire for the young lefty, but I’m starting to think it’s playing to Montgomery’s strength. His best pitch is his change-up, which he throws mostly to righties. It generates whiffs, and it seems to give right-handers some trouble. Remember that in the minors, Montgomery always had a good change, and seemed to struggle to come up with a breaking ball. He’s got a curve now, but it seems to be a step behind the change. Part of the reason the change is so good is because Montgomery gets so much horizontal movement on it. It’s thrown from a high release point, but gets nearly a foot of horizontal, arm-side run (!). That’s not unprecedented or anything, but the guys who typically do this throw from much lower angles – Chris Sale and Charlie Furbush, for example. Guys who can throw over the top and get that much run often have good change-ups – Fernando Rodney comes to mind here, but perhaps that’s not the best example right now. Looking at Montgomery’s minor league stats, he’s always run reverse splits. Since 2011, he’s struck out fewer lefties, walked more, and given up more HRs more often. The league has probably helped him by sending out nearly 100% RH lineups thus far, but he’ll see three lefties in today’s game. Should be interesting to see how he adjusts. Tacoma didn’t have an extra-inning comeback in them last night, losing in extras to Albuquerque 3-2. Justin Germano pitched well for the R’s and matched Eddie Butler (the hard throwing, no-bat-missing former prospect I mentioned yesterday) through 6. Mayckol Guiape gave up the winning run in the 11th. Today, Sam Gaviglio starts for the Rainiers. Edwin Diaz outpitched D-Backs prospect Aaron Blair in Jackson’s 4-3 win over Mobile. Diaz gave up 1 run on 3 hits and 2 BBs in 7 innings, and he struck out 7. He’s now gone at least seven in back to back starts, which is great, considering no one else on Jackson has pitched beyond 6 IP all year. I’ve mentioned Jackson’s had the worst staff in the Southern League – by a mile – but I was still stunned to hear that, courtesy of the Generals twitter feed. Moises Hernandez starts today. Here’s hoping it goes a bit better than his brother’s start yesterday. Bakersfield lost to Modesto 4-3 despite three hits from 3B Jay Baum. Brett Ash starts today against Rockies prospect Antonio Senzatela, a hard-throwing Venezuelan righty. Clinton gave up 2 runs in the 9th, and lost to Lake County 9-8. Chantz Mack and Joe DeCarlo homered for the Lumberkings off of Justus Sheffield, but the pitchers struggled (with the exception of reliever Kyle Schepel, who K’d 5 in 2 2/3 hitless innings. He just joined the L-Kings from the independent frontier league – he had been in the Arizona organization. Jefferson Medina starts for Clinton today as they take on Fort Wayne. Marc, I got to thank you once again for doing these game previews. These are must-reads for me every day, and you do an absolutely fabulous job with them. And I love that you do a mini-recap of the previous day’s minor league results. What with the drudgery of following a season like this one has been so far, it must be difficult to grind these out every day. You obviously go to a lot of time and effort to do this, and for my part, I’m very grateful you do. I agree, the minor league recaps are absolutely invaluable. Please, please keep it up. Wait….was that a successfully executed sac fly I just saw? Being a fan of this team feel like being in an abusive relationship. Yes, I gotta add my “me too” – thank you Marc! I hope you realize you’ve got a lot of fans of your writing here. Having Weeks (better weeks than months) in the lineup came dangerously close to saying we weren’t giving a … anymore. OK, LoMo, let’s go for 3 HR’s in one game!